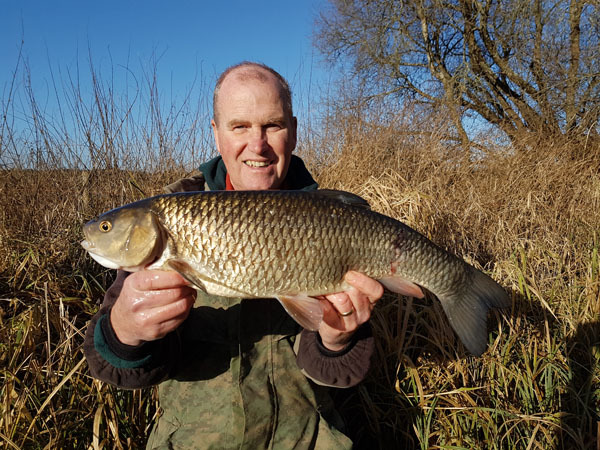 I had been able to fish again on the Friday and headed down the Avon valley to see if I could temp a chub or two. My aim with the river being the same height was to fish the same swim. Andy (you should have been here yesterday) Cowley was going to fish too. I arrived at 7.15 with a very hard frost on the ground. Andy was running late so I made my way to the swim I fished the previous visit. I bait dropped in 6 droppers of red maggots and went for a walk. The colour was good and the level perhaps dropped a bit. After about an hour I cast out and had a few bangs on the tip where chub were mouthing the bait. I phoned Andy and he was doing some pike fishing to start and would see me later. My first bits came reasonably quickly and I was playing an angry chub. It stayed deep in the water and used the current well in an effort to dislodge the size 20 hook. Luckily the hook hold held and I walked downstream to land the chub. It looked a decent fish and pulled the scales around to 5lbs 10oz. It was marked on both sides not too sure whether it was an otter or cormorant damage. I phone Andy to take a look and photo which he duly did. A great start to the day. The frost hung around for most of the morning and it was chilly. I was still very weak from the flu. Disaster struck a little later as I hooked a big chub that I just couldn’t stop from getting into the willow branches. It was no barbel but a good fish. Buggar or words to that effect. Andy walked past and said that it was probably the 7lber. How he didn’t end up the river I’ll never know!!!! Andy was float fishing a swim where he has been catching smaller chub and we both thought it was still fishable. He caught a 4lber which was great and saved a blank. He then phone me to ask if I could photo a 6lbs 15oz chub for him. It was a beautiful chub and to land it on the float was very skillful. This is the 4th chub of 6lbs 15oz he has had. So very unlucky indeed not to land a 7lber. 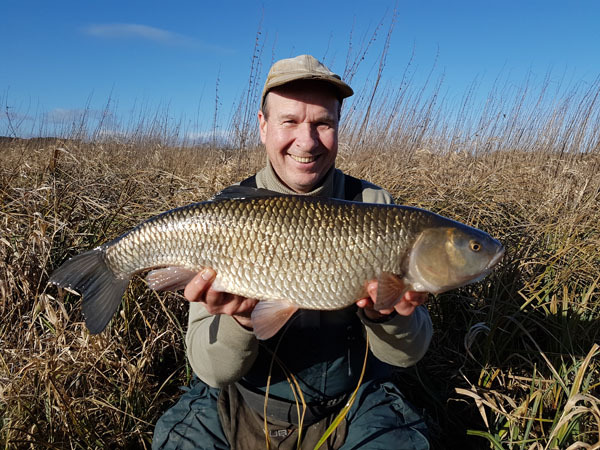 I was ecstatic and elated for him as it was his first 6lb chub of the season. Andy went on to land another 4lber. Me I stayed until the bitter end and only had one more pluck but nothing else. What a great day for Andy I was so pleased for him. This entry was posted on Friday, January 26th, 2018 at 6:46 pm	and is filed under Uncategorized. You can follow any responses to this entry through the RSS 2.0 feed. Both comments and pings are currently closed.